All transactions are safe and secure with a reliable history in online purchasing behind each of our associates. Buy the Let's go to the mall! ...today! t-shirt to own How I Met Your Mother clothing and merchandise. 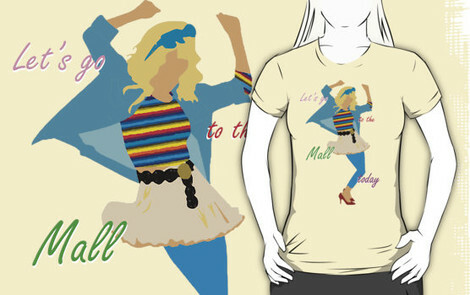 The design on this Robin Sparkles tee promotes her 80s themed song "Let's Go to the Mall," which was a big hit in Canada. Eventually, the gang on the How I Met Your Mother TV show finds out that this is why Robin (Scherbatsky) fears shopping malls. Robin's secret is how the slap bet between Marshall and Barney begins. Marshall believes that Robin was once married in a mall, and Barney thinks that she was in a pornographic movie filmed inside a mall. In addition to the Let's go to the mall! ...today! tee above, browse the How I Met Your Mother Clothing Gallery for more apparel like men's and women's clothes, kids shirts or hoodies.